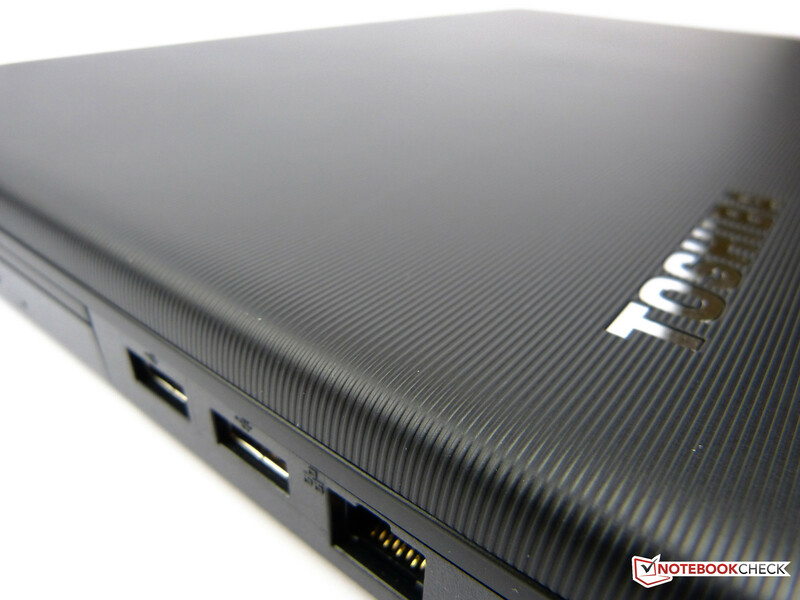 The target group of Toshiba's Tecra A50 is clearly defined: It wants to be the perfect laptop for medium and larger companies with its matte Full HD screen, a whole range of security features, and both a SmartCard and ExpressCard slot. The predecessor Tecra R950 already reaped in impressive results, but a few points were ultimately deducted for the insufficient cooling and omitted graphics switching. The A50 is now to follow in its footsteps and fix exactly these points. However, Toshiba has made a few cutbacks. Instead of an Intel Core i7, the buyer now has to live with an Intel Core i5-4300M. 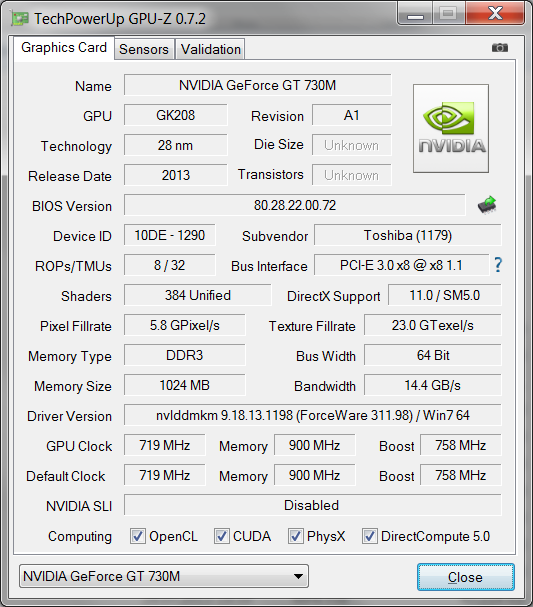 In return, Nvidia's Optimus allows disabling the external GeForce GT 730M graphics card. 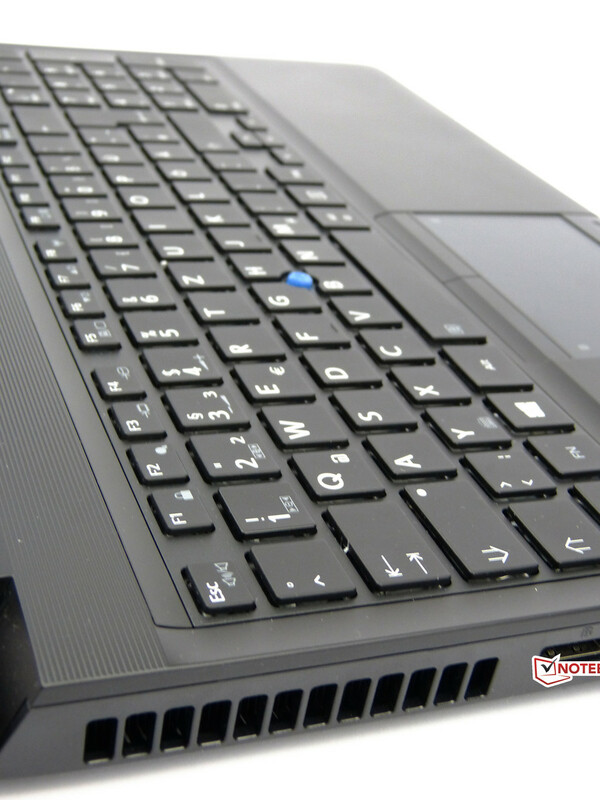 In this review we want to find out whether these modifications are enough to make the Tecra A50 the ideal work machine for medium and larger companies. 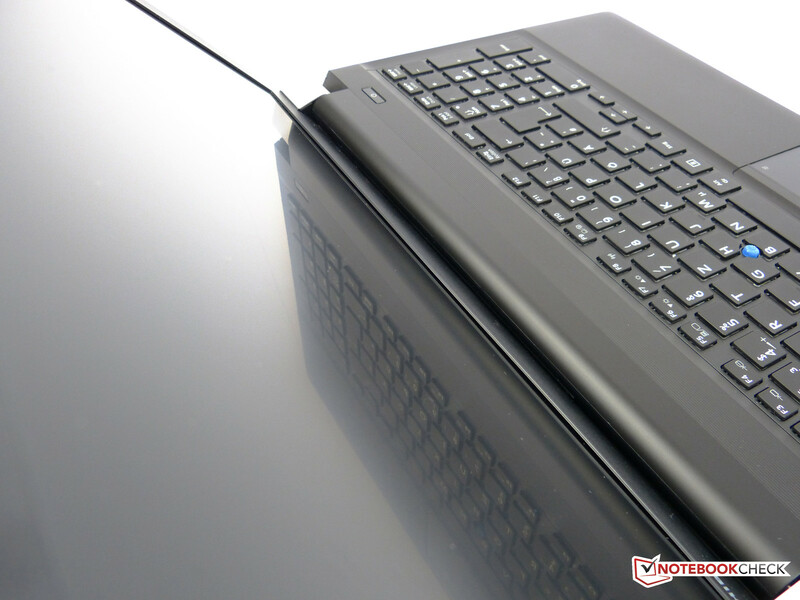 The Tecra A50 presents itself as a plain yet solid work laptop on the desk. Both the wrist rest and the keyboard bed of the 2.6 kilogram (~5.7 pound) device only warp marginally even with very high effort. 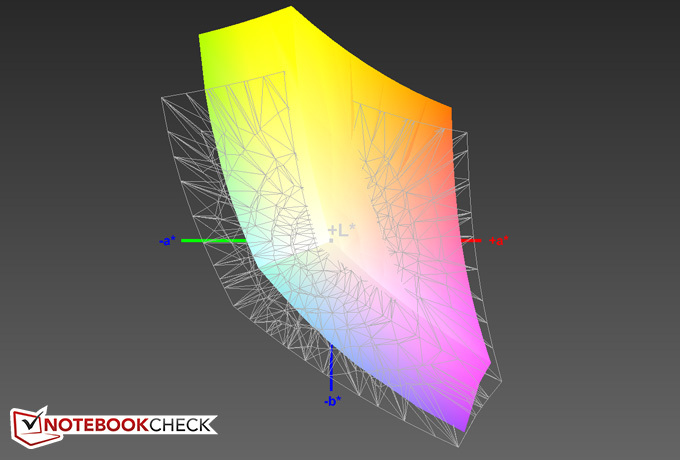 However, the display lid twists when just normal force is applied. The casing's feel is convincing throughout. The display lid's back, the wrist rest, and an approximately two centimeter wide strip above the keyboard are grooved. That not only has a premium feel, but will also likely provide a certain, though minor, cooling effect. The build does not give reason for reproach either. All edges are rounded cleanly, and the gaps are evenly spaced. 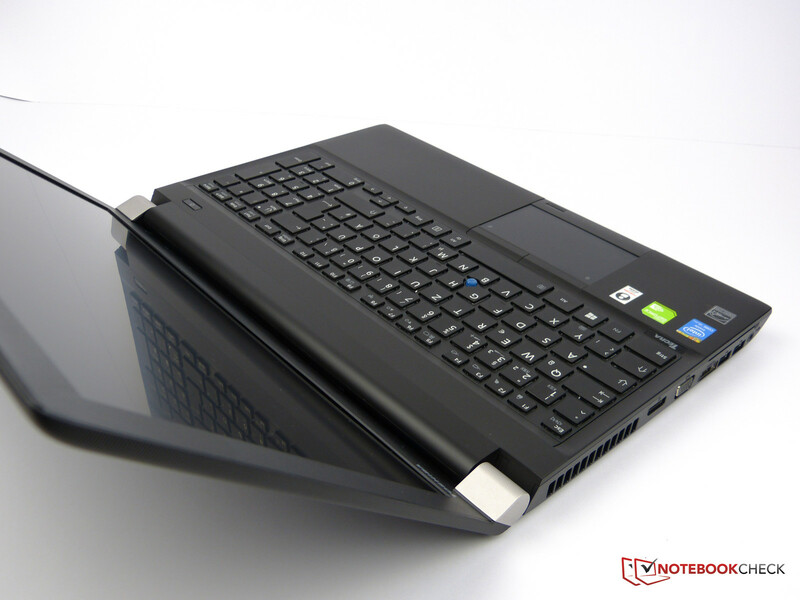 With this, Toshiba creates the basis for a solid business laptop. A good casing grade helped the Tecra R950 predecessor so the tradition continues. 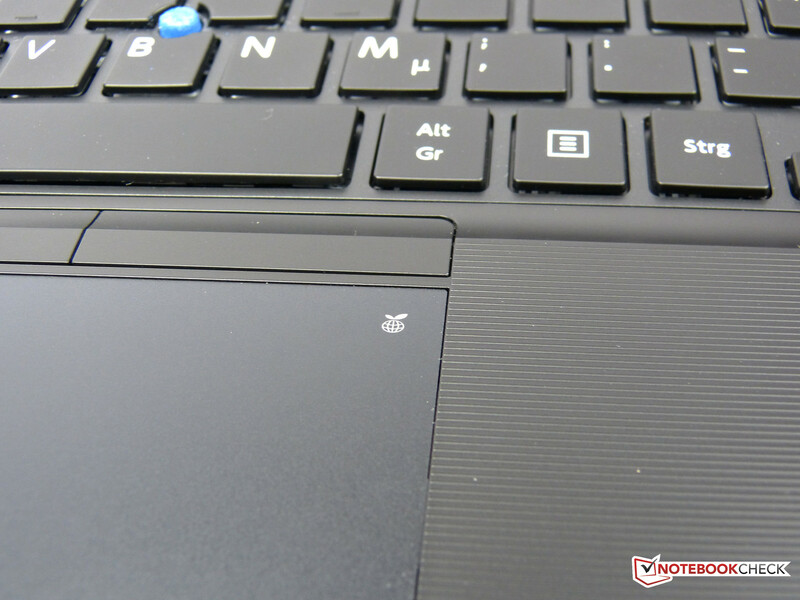 Being a business laptop, Toshiba's Tecra A50-A12Z features many interfaces that are not usually found in consumer devices. This not only includes a DisplayPort, but a combined eSATA / USB 2.0 port on the left. Four more USB ports, distributed evenly over both sides of the device, provide enough opportunities for connecting external peripherals. The two USB ports on the left support the latest 3.0 standard. All unwieldy interfaces have also been placed on this side to ensure as much room as possible for right-handed, external mouse users. Since the ports are paired, the neighboring port might be obstructed when using an extra-wide USB stick though. Toshiba also installs a VGA socket for analog video signal transmission. 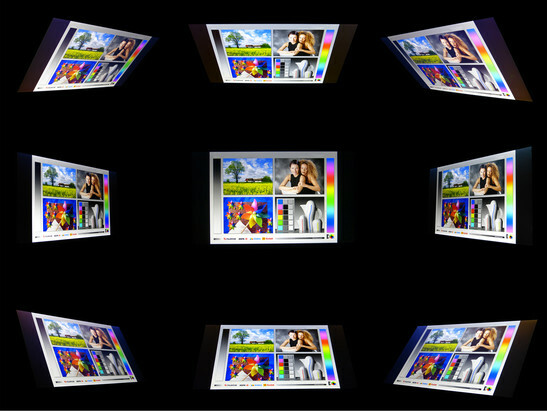 Thus, older monitors and projectors can be used easily. We did not ascertain any weaknesses with this port's image quality. 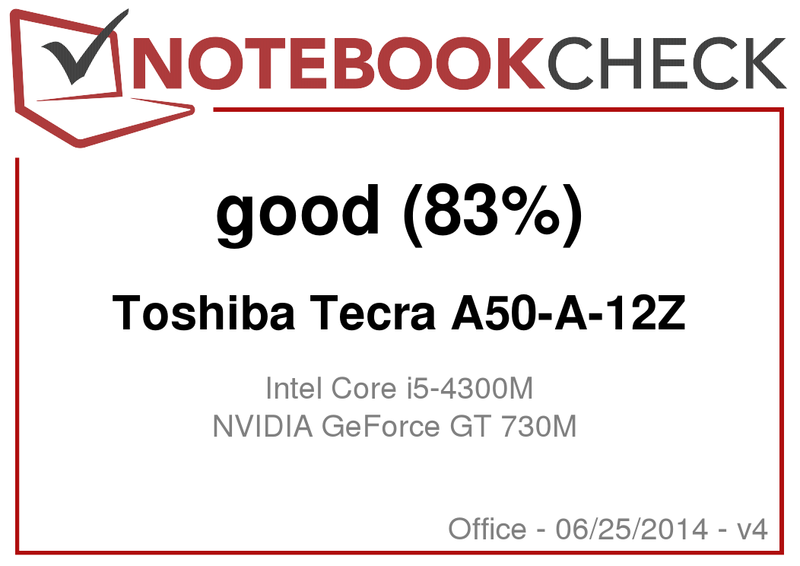 Toshiba relies on an Intel Centrino Advanced-N 6235 chipset for wireless communication in its Tecra A50, which delivered overall good results. The laptop was still online in places where other devices would have long lost the Wi-Fi signal (ThinkPad Edge E135, IdeaPad A1). The A50 did not have problems with cabled reception either. It supports Gigabit LAN. 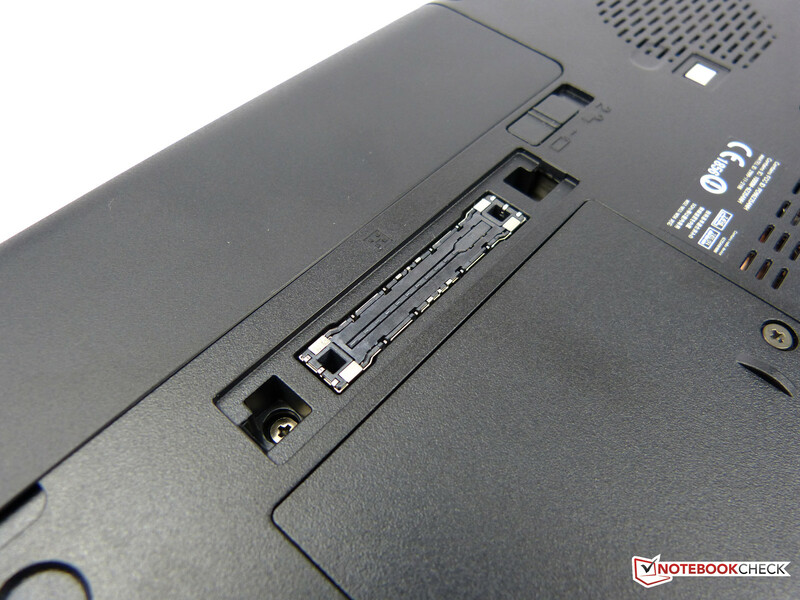 Our review sample did not sport an integrated WWAN card and such a wireless module is not available in other versions of the laptop. 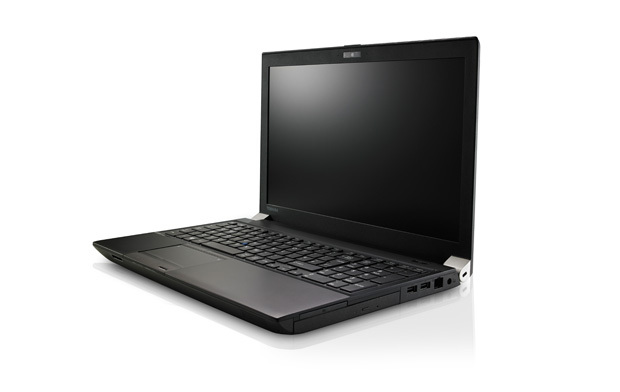 Toshiba's Tecra A50 supplies a whole range of security features as expected in a laptop designed for medium and larger companies. 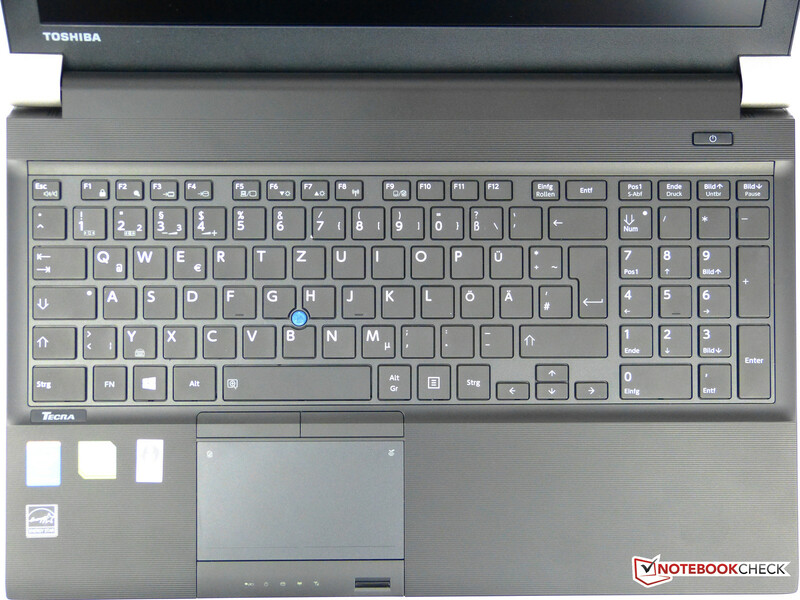 This not only includes a fingerprint scanner located below the touchpad; the laptop also sports a TPM module. Our Tecra A50-A-12Z series model also provides a SmartCard slot. Besides that, the script on the Japanese company's homepage indicates an SED (self-encrypting device) purchase option. Toshiba does not state prices or buying sources for this module. A more detailed description of this security feature can be found in this article. Goodies, such as external mice or headphones, should not be expected in the A50's box. Instead, Toshiba restrains itself and includes only two installation DVDs for Windows 8 Professional, besides a quick start manual and general safety instructions. Windows 7 is installed by default. Users who want the latest operating system from Redmond will have to install it themselves. 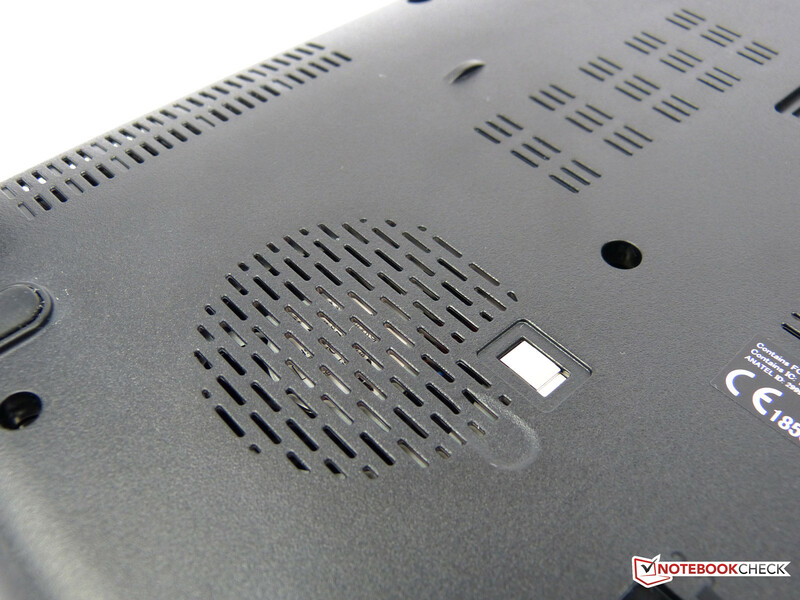 We found a docking station port on the review sample's underside. It is priced with an RRP of 249 Euros (~$343) and supports six additional USB ports, two of which work with the latest 3.0 standard. It also supplies an HDMI port and a LAN cable can be connected to it. 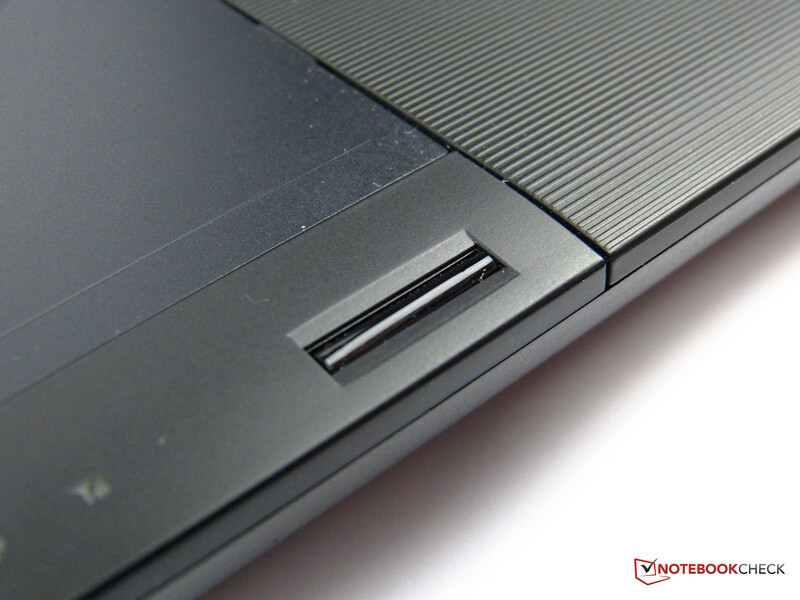 Toshiba makes accessing the innards easy. Both the HDD and RAM (one of two banks occupied) are revealed right after removing two Phillips screws. However, the entire base plate can be lifted off with only a bit more effort. Upgrading the named components is thus possible. Buyers of this laptop have to be satisfied with a warranty period of just 12 months. 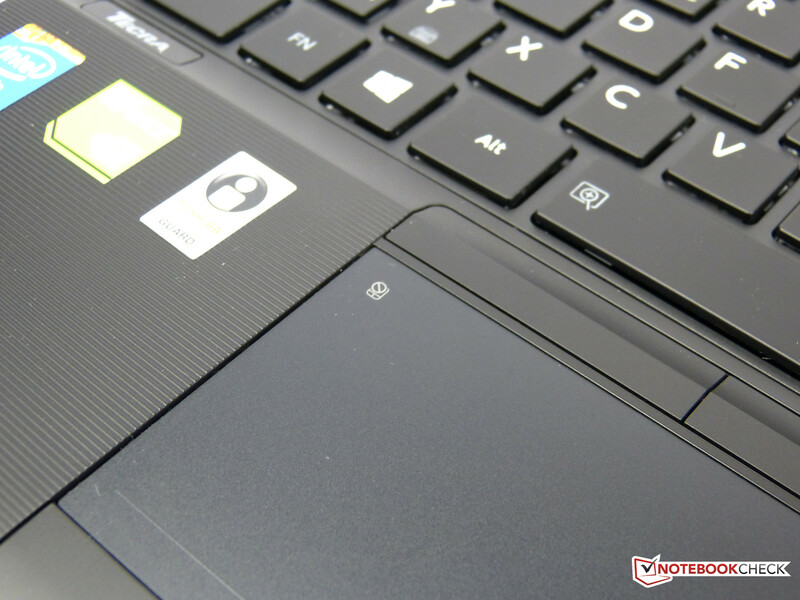 The customer has to bring or send the device to a Toshiba service partner when the laptop is not registered on the hardware manufacturer's website. When registered, the warranty period is not extended, but the service then includes on-site service in Germany and Austria. Warranty upgrades are also available: 74 or 99 Euros (~$102 or $136) is charged for a total of 36 months, and a warranty period of 48 months is offered for 159 Euros (~$219). 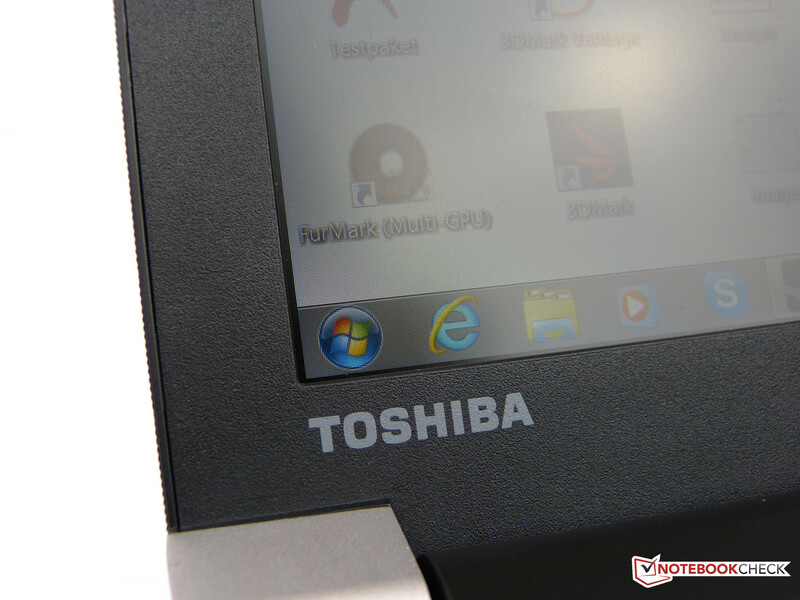 A special (limited) offer from Toshiba: When the (qualified) device is registered within 30 days, the buyer can claim the "Reliability Guarantee". 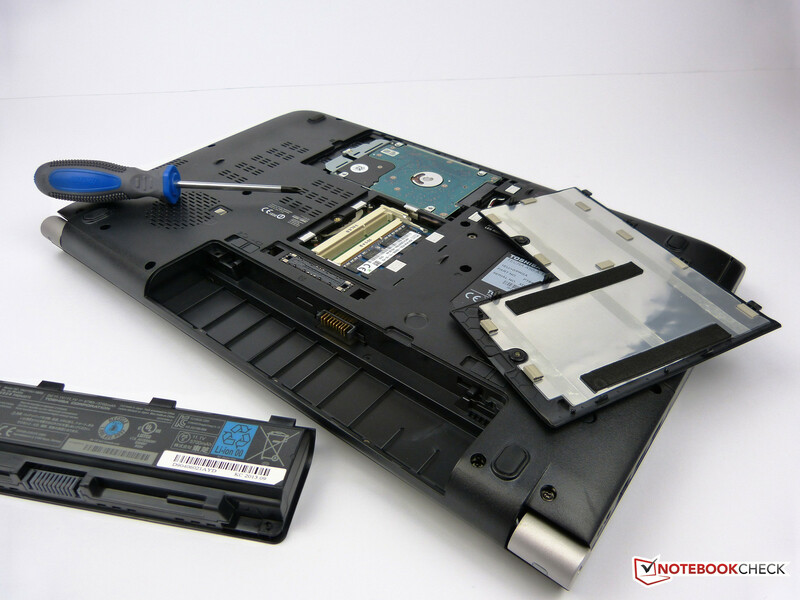 The laptop is not only repaired free of charge, but the buyer also gets a full refund should the device break down within the first year. The keyboard of our review sample makes an overall good impression. 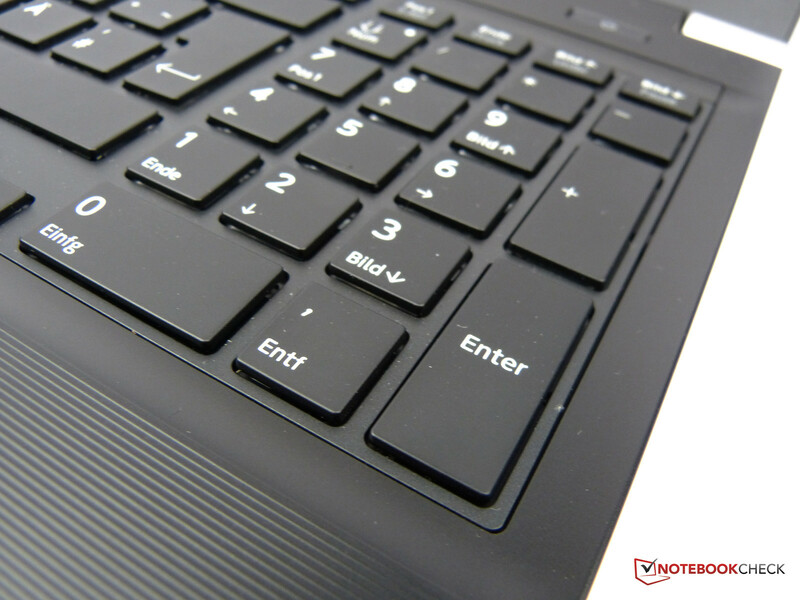 Besides a clear pressure point, it convinces with a first-rate typing feel that strongly reminds us of Lenovo's ThinkPads. 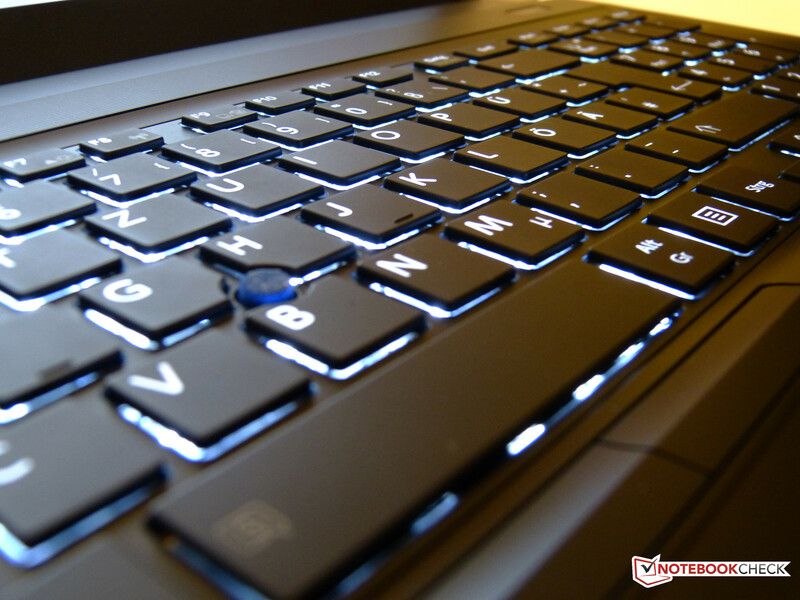 The icing on the cake: Toshiba installs a keyboard backlight to facilitate working in the dark. 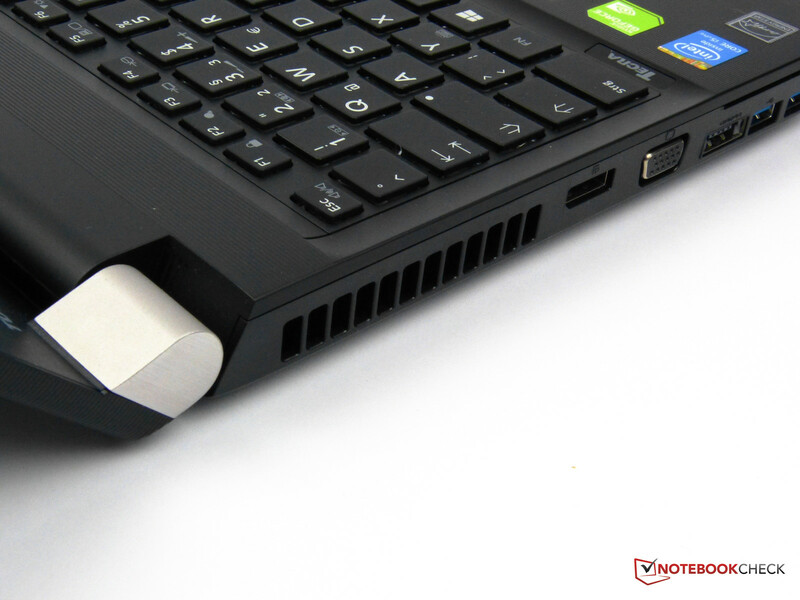 However, we have one point of complaint: The space bar in our review sample has been downright miniaturized. 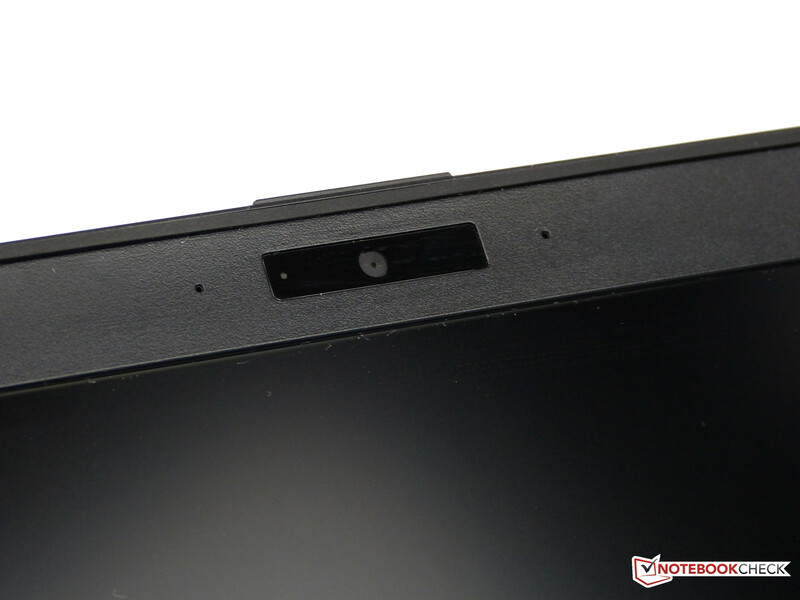 For comparison: It is two centimeters longer in the 11.6-inch, and thus much smaller ThinkPad Edge E135. 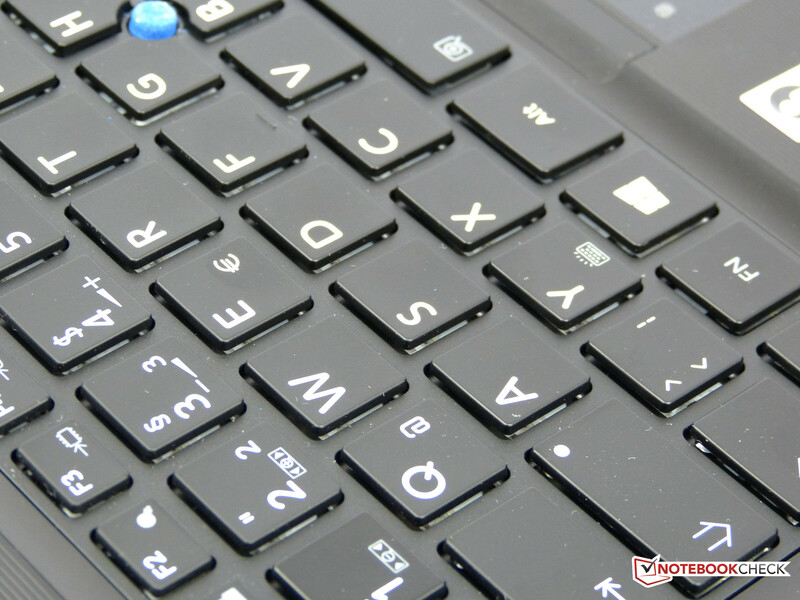 We barely hit the reduced space bar when we touch-typed on Toshiba's Tecra A50. Omitting the menu key in favor of a larger space bar would have likely been better here. 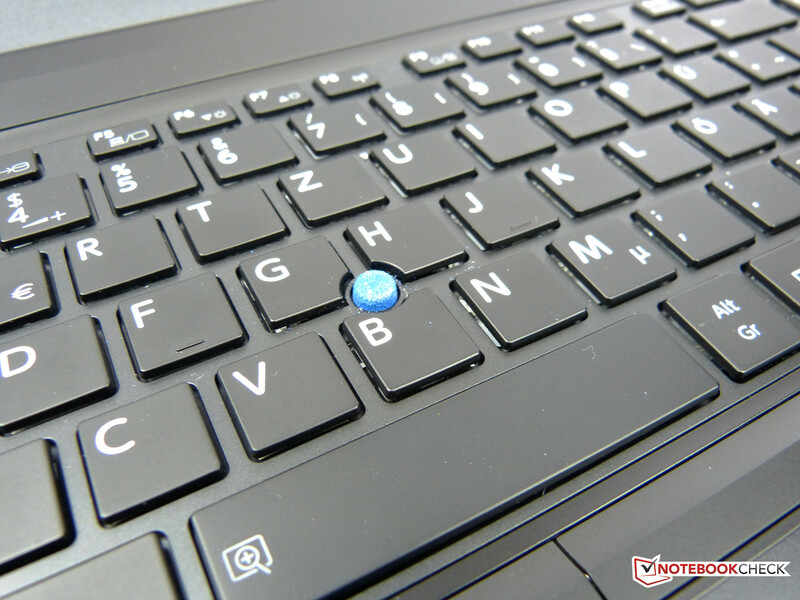 Toshiba not only installs a traditional touchpad, but also a TrackPoint that is found in a similar form in many other business devices. 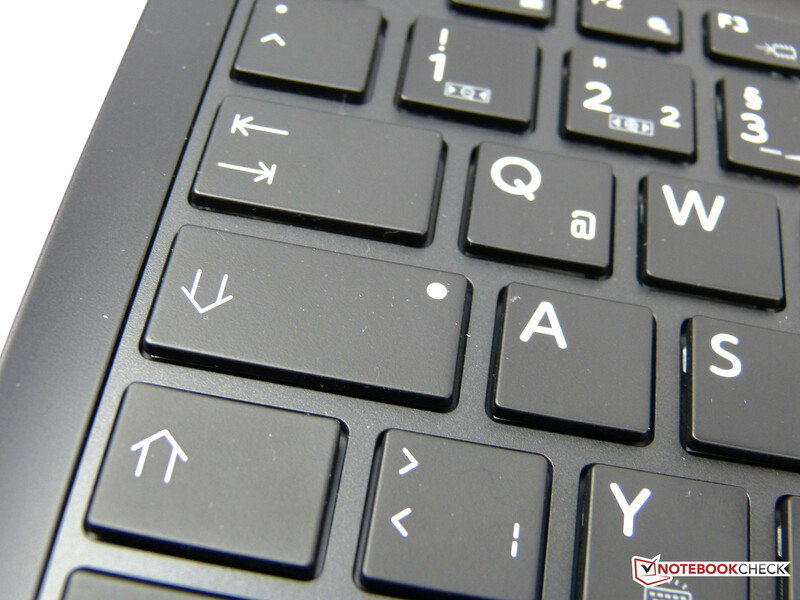 The touchpad buttons have been moved between the pad and the keyboard to facilitate using this input option. The TrackPoint justifies its existence again in the Tecra A50. The mouse cursor reaches its destination considerably swifter and faster with a bit of familiarization. The convincing touchpad will satisfy users who cannot get used to this extra input device. Double clicks and multi-touch gestures are detected and implemented reliably; the sleek surface allows moving the finger easily and without difficulties. 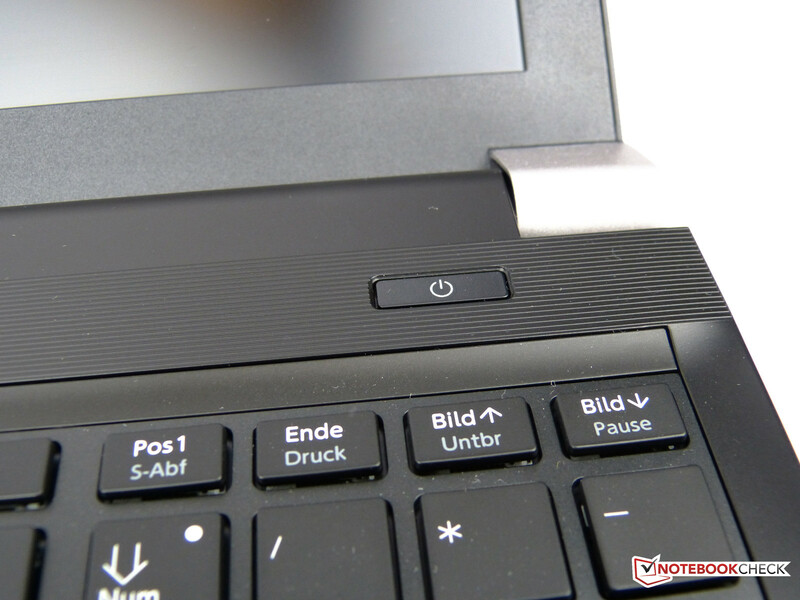 The buyer will not have to live without the mouse buttons below the touchpad. 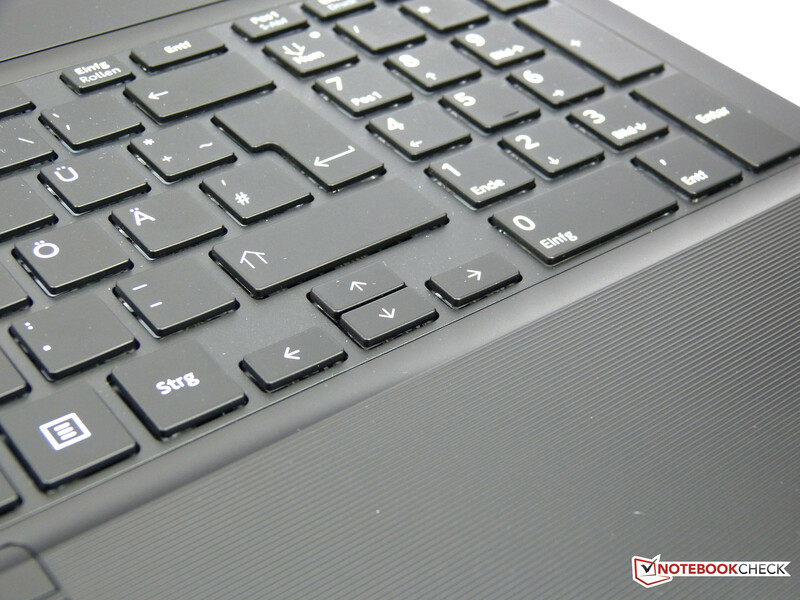 A few millimeters of the touchpad's lower part is separated by a light, horizontal rubber coating, and can be used for left and right clicking. 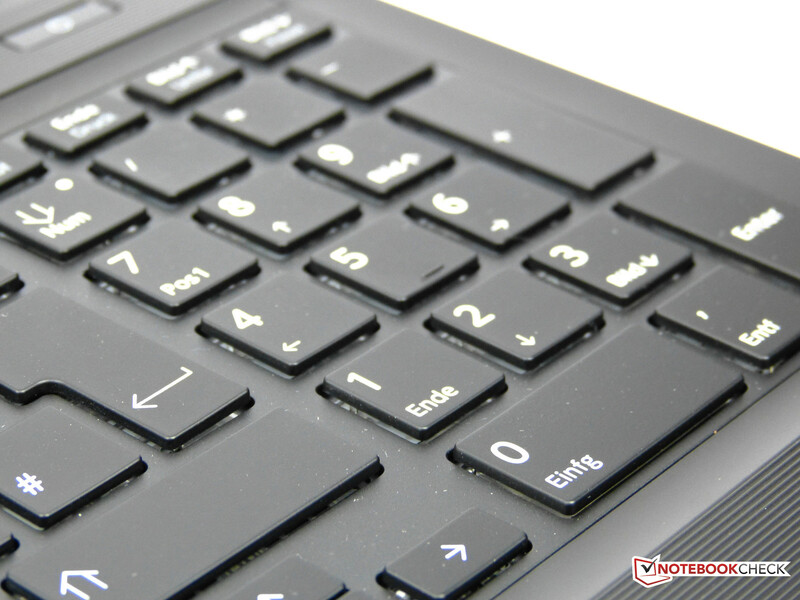 Users with larger hands can easily and quickly disable the touchpad while typing when required. 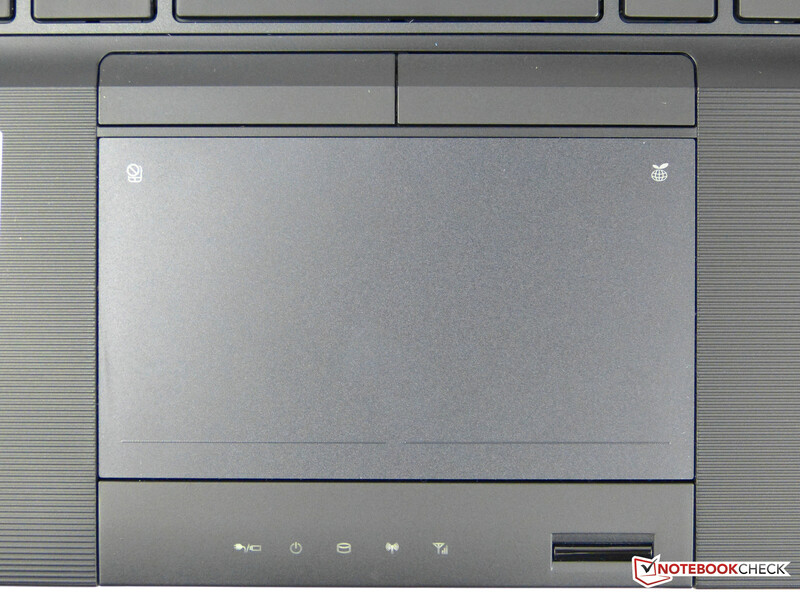 Toshiba installs a touch button in the upper left; the symbol lights up on the touchpad itself when the pad is disabled. Toshiba's "Eco Mode" can be activated in the same manner; the button for this is however found in the pad's opposite, so right upper corner. 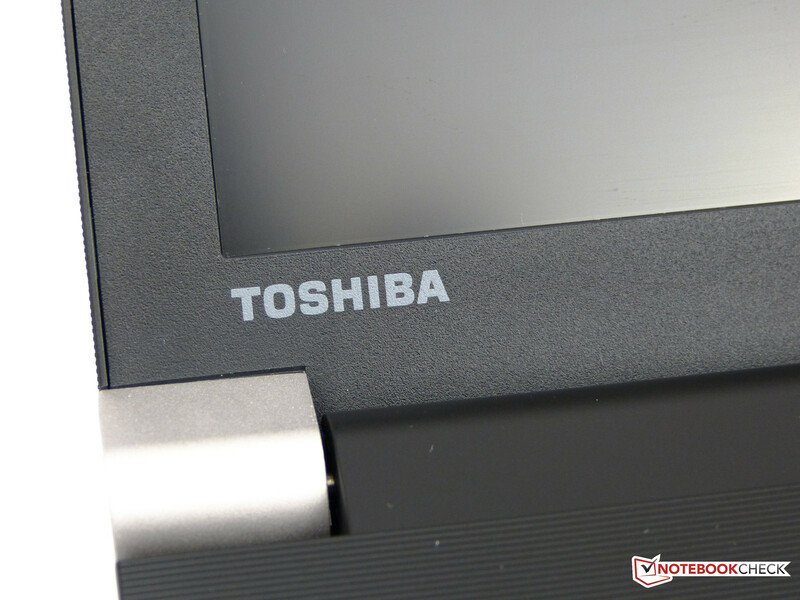 Toshiba installs a screen from its own product line in our review sample. It has a resolution of 1920x1080 pixels and a matte surface. Despite the fairly high price, the Japanese manufacturer does not incorporate an IPS display, but uses a TN screen with an LED backlight. However, this screen cannot be called cheap. Its average brightness of 265.1 cd/m² not only allows comfortable working indoors, content also remains well legible even when working in brighter surroundings as long as the sun does not shine directly on the screen. The matte surface also prevents distracting reflections. The illumination is also first-rate. It is relatively homogeneous with 91%; brightness differences are not visible to the naked eye. 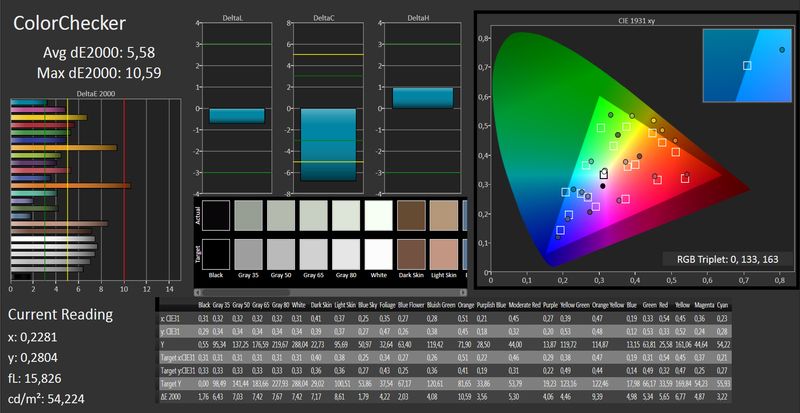 The screen achieves just as good rates in the analysis of black level and contrast. Black content is displayed in deep black with 0.29 cd/m². The contrast of 900:1 from which we derive the black value is also in the upper range. 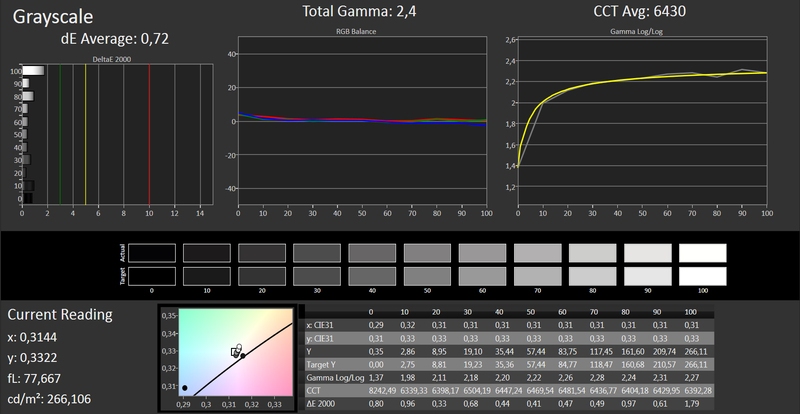 The sRGB color space coverage of 73.48% is rather average. 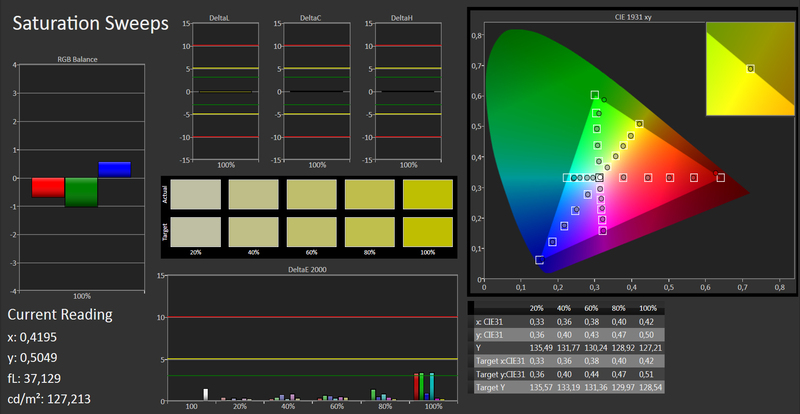 However, the coverage in the green-yellow comparison color space is higher overall. 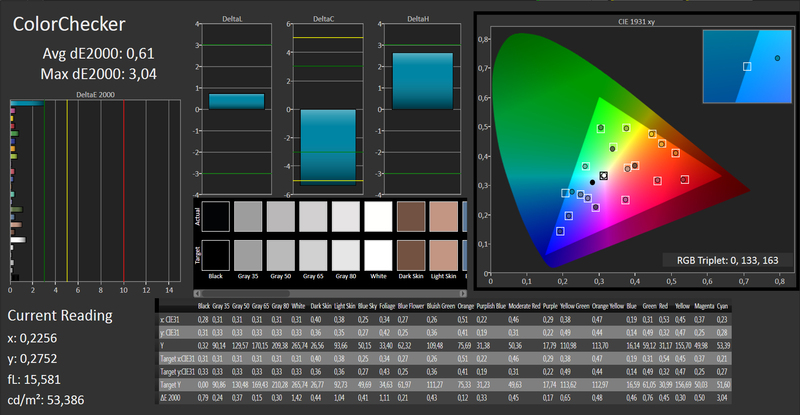 Accordingly, the screen also achieves a rate of 53.94% in the AdobeRGB color space comparison. The color space coverage is however only important for professional graphic designers - and they should look for a different device. 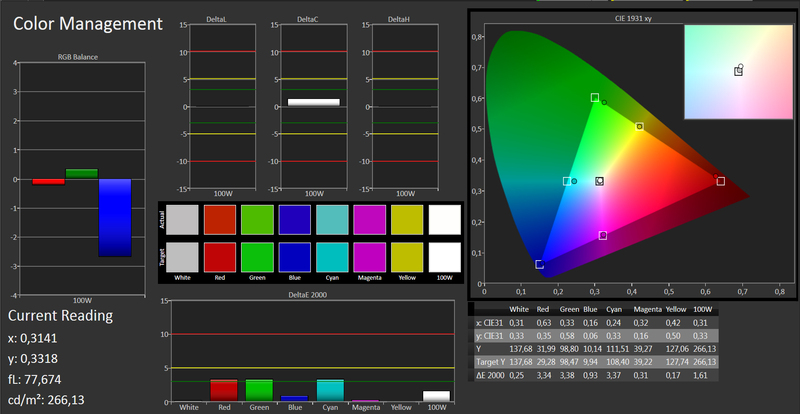 The screen's color shift is within an adequate to good range with an average DeltaE rate of 5.58 without calibration. There are peaks particularly in the red-yellow colors, where a deviation of up to 10.59 (DeltaE) is reached. The grayscale is similar to color with a shift of 5.63. Calibrating the screen reduces these rates considerably. 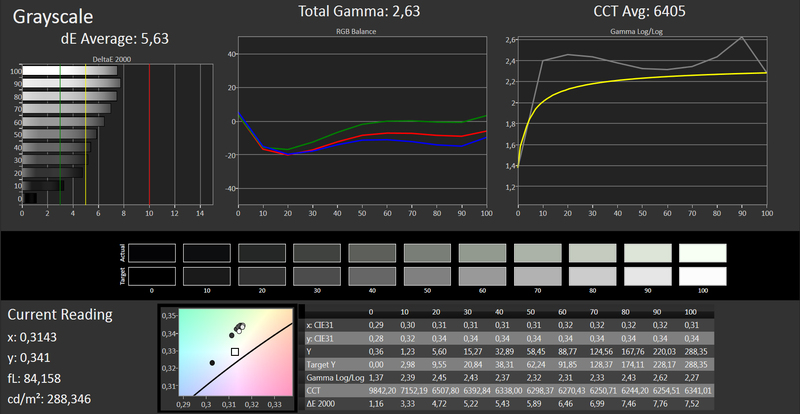 While the grayscale achieves an average shift of 0.72, the DeltaE in colors sinks to 0.61. This allows an overall very detailed color reproduction. The viewing angles of Toshiba's Tecra A50 are not as good as in a laptop with an IPS screen, but they are nevertheless impressive. The image first dims at a viewing angle deviation of approximately 45°. However, the user will not have to struggle with color inverting from any viewing position. Unfortunately, the lid's maximum opening angle has worsened compared with Toshiba's former Tecra R950 model. The lid cannot be opened any further than an angle of approximately 105°. 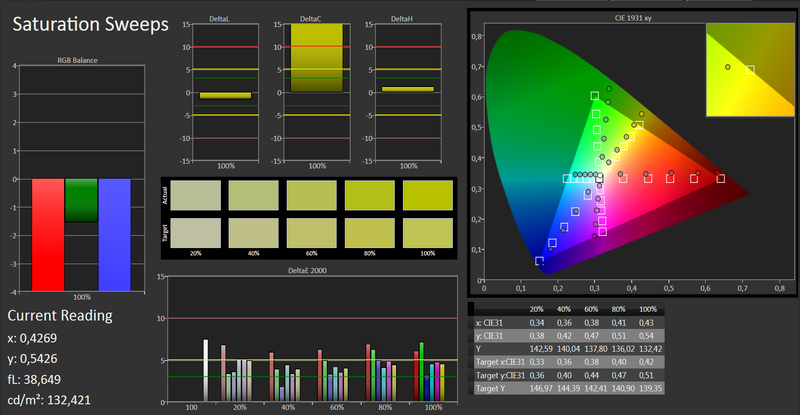 Buyers who are satisfied with a matte screen with an HD resolution should look at other Tecra versions (e.g. A50-A-13C, A50-A-12P). They are also easier on tight budgets. 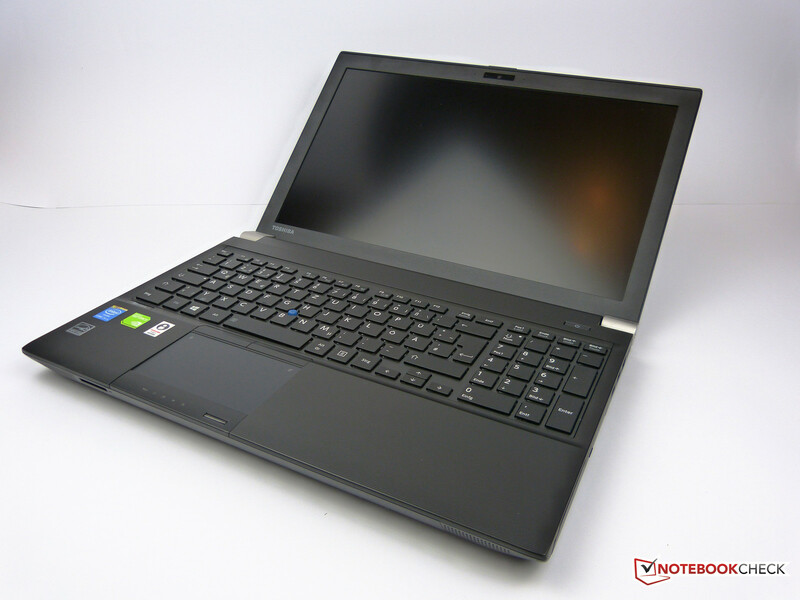 Our review sample wants to establish itself as a business laptop for medium and larger companies. Its matte screen, decent input devices, and convincing build are the first steps in the right direction. 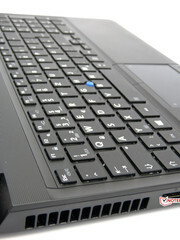 However, it is the hardware configuration of a business laptop that also counts in the end. The addressed companies will likely focus primarily on two factors: A smooth-running and largely lag-free working platform, and appropriate performance. The laptop we tested is neither an ultra-portable office device nor a high-performance machine. 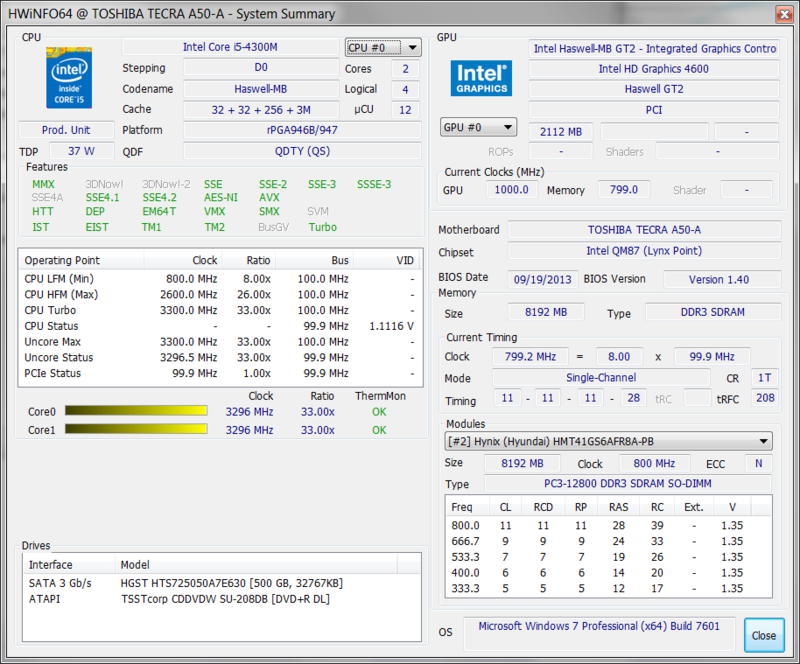 An Intel Core i5-4300M is installed in Toshiba's Tecra A50. It features two cores and a base clock of 2.6 GHz. Thus, the processor is neither a low-voltage CPU nor a quad-core model. Users who want especially long battery runtimes and portability will inevitably take another laptop, but users with high expectations of computing power should also look for devices with quad-core processors or dual-core processors with a higher clock. However, the processor does not fail its purpose. Smooth working is no problem with our laptop; even executing multiple programs at the same time does not cause difficulties. Typical business applications, such as process modeling, should not be a problem even with larger projects and files. 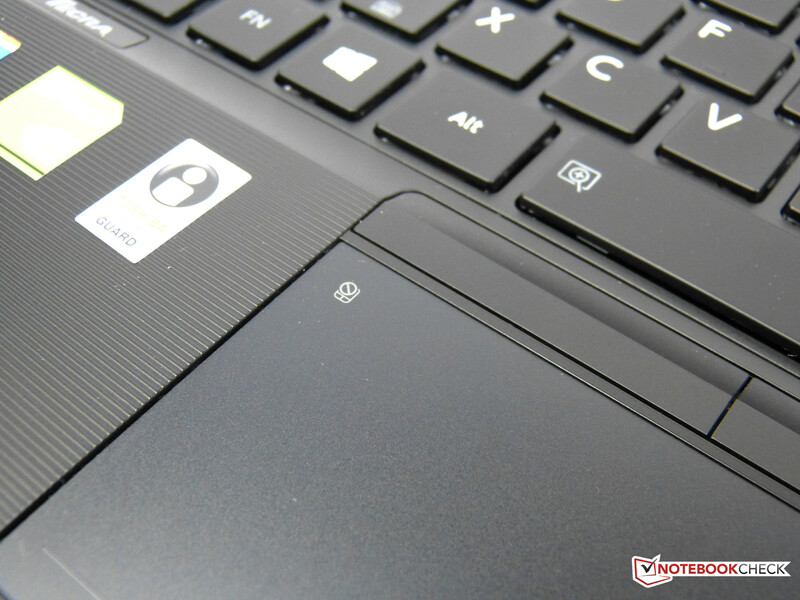 We will omit comparisons with other devices using the same CPU here because the processor that can increase its clock to 3.3 and 3.2 GHz (dual/single-core operation) via Turbo Boost was only installed in one laptop that we have reviewed until now. 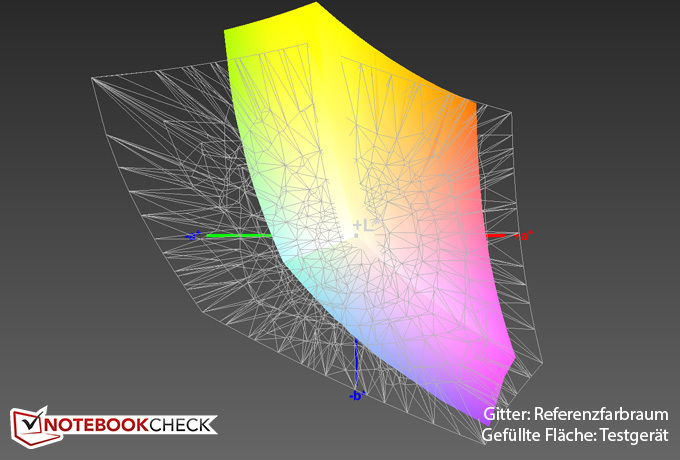 Schenker's XMG A503 usually had an approximately 10% lead in the test runs using the Cinebench tool. We also use a device with an i7-4700MQ, i.e. 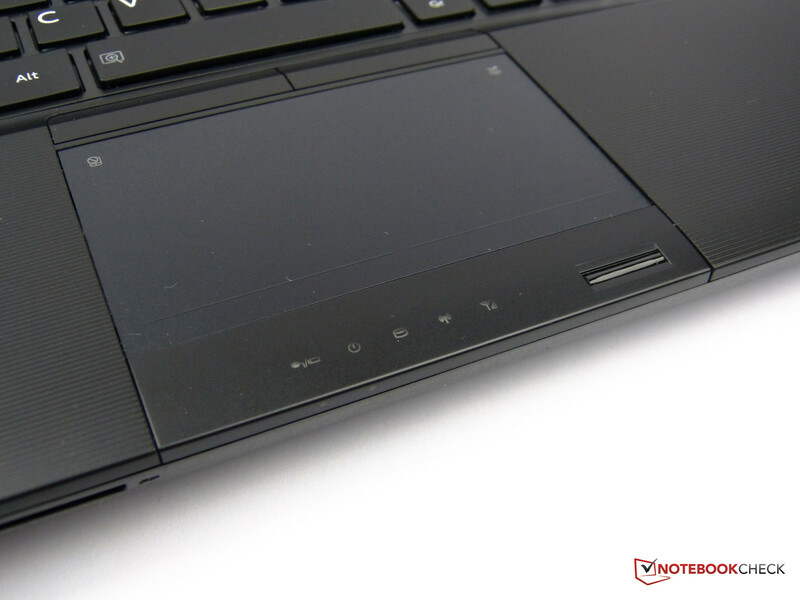 Toshiba's Satellite L70-A-10T (GT 740M) for a better evaluation of the performance. Buying a device with a quad-core processor could prove quite worthwhile as can be seen in our chart below. The CPU performance of our review sample is not throttled in battery mode (Cinebench R11.5 Multi 64-bit: 3.12 vs. 3.13 points). We used the PCMark Vantage and PCMark 8 tools to assess the system performance. The benchmarks of both tools were disappointing. Our review sample achieved 6221 points in the total score of PCMark Vantage and lags behind its predecessor by 30%. The result looks similar in the Productivity and Communication sub-scores; the predecessor is superior by 10 and 20% (5135 vs. 5538 and 9261 vs. 11148 points). The PCMark 8 score is even worse. Of all 79 reviewed devices, the laptop ends up in 74th place with only 2015 points. The Work sub-score looks a bit better: 2641 points and place 53 of 78 is a slight improvement. However, even laptops powered by a low-voltage CPU, on-board graphics card, and conventional hard drive surpass our review sample. 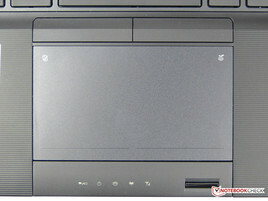 An example: HP's ProBook 430-G1 (2585 points, Intel Core i5-4200U, Intel HD Graphics 4400). A possible reason for these poor scores might be the RAM is connected via a single-channel (only one of two slots occupied). Is the reason for the laptop's poor score perhaps its hard drive? We first have to say no. The 500 gigabyte Hitachi Travelstar Z7K500 reaped in an average transfer rate of 114 megabytes per second in HD Tune; the minimum data rate of 74 megabytes per second is very high. These good rates also correspond to our findings in the CrystalDiskMark tool, which also enables assessing the transfer rates of smaller data amounts (512k and 32k test). Our device only managed poor rates here. While the hard drive still achieved an average transfer rate of 41.97 MB/s in the 512k Write test, the rate dropped to 27.82 MB/s in read access. Thus, the hard drive places 482 and 802 of approximately 900. This got even more extreme in the 4K test: With 0.361 and 0.691 megabytes per second (read/write), the hard drive is in the last fifth of our ranking chart. This outcome could also be partly responsible for the poor score in PCMark Vantage and 8. Other devices based on the same hard drive achieve up to 5431 points in the HDD sub-score of the first-named tools. Our device lags behind with 3880 points here. 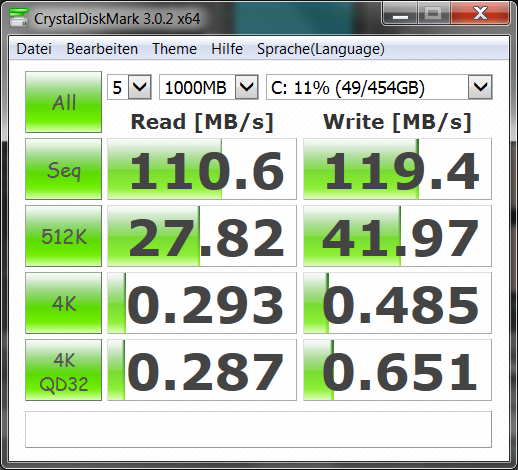 This result could be improved by exchanging the hard drive with an SSD (solid-state drive). This would be possible within 15 minutes due to the maintenance-friendly casing. However, the operating system and software would have to be reinstalled. 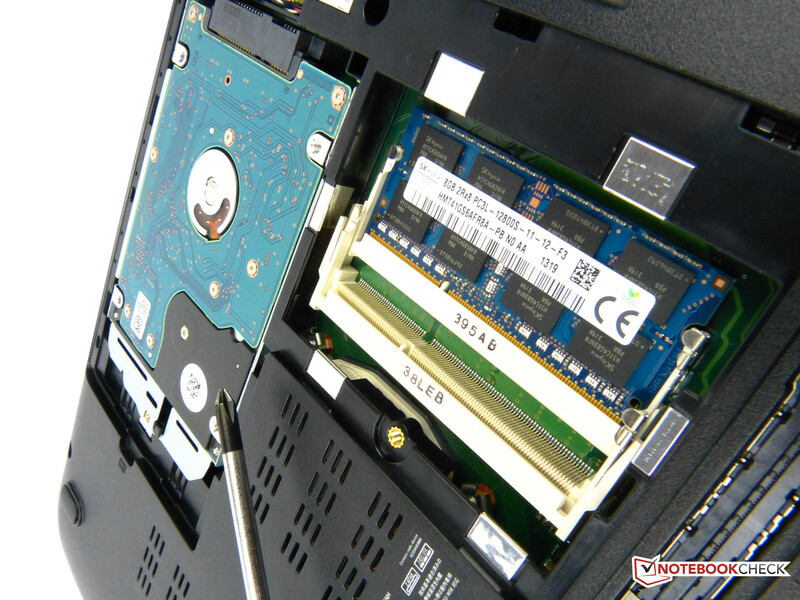 We did not discover another, empty SATA or mSATA slot. One of the main differences compared with the Tecra R950 predecessor is the dedicated graphics card from the hardware manufacturer Nvidia. 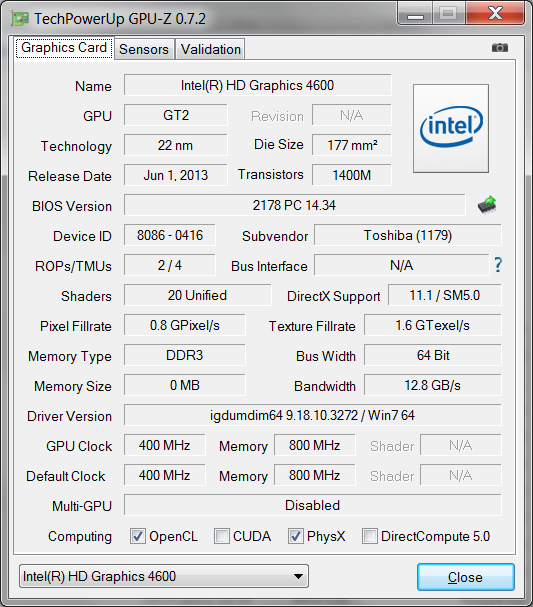 While it was not possible to disable the R950's dedicated graphics card, the Tecra A50 can use the integrated Intel HD Graphics 4600. This makes sense particularly in MS Office and processor-heavy operations because the battery runtime can be increased considerably this way. Buyers can also make use of various technologies, such as Nvidia's CUDA, and it is possible to connect up to three additional monitors. The dedicated GeForce GT 730M is enabled in graphic-intensive applications and, of course, games. Until now, we have tested this card in two Acer laptops, the Aspire V3-571G and the Timeline Ultra M3-581PT. Our review sample places itself last place in all graphics benchmarks, with the exception of the physics benchmark. One reason for the Acers’ approximately 25% better results on average could be the graphics card's 1024 megabyte working memory; it has twice the capacity in Acer's Aspire V3-571G. The GeForce GT 730M makes the Tecra A50 apt for occasional 3D gaming. The race game F1 2013 still ran smoothly with 66 frames per second even in high settings. However, it sometimes stuttered in the ultra setting, and only partly achieved playable 27 frames. Users who want to enjoy the shooter based in Moscow's subway Metro: Last Light should not go beyond the lowest settings. The game was no longer playable in medium settings due to 21 frames per second. The laptop still managed 28.1 frames on lowest settings. Full HD and maximum settings should not even be considered - the game turned into a slideshow with 6.6 fps. Seen in total, most games can be played on Toshiba's Tecra A50, although both the resolution and details have to be reduced. This is also true for Tomb Raider. Lara Croft faced her adventures with only 41.2 frames per second; the frame rate dropped to 22.8 fps in high settings. Only older games with low requirements would be playable on the integrated Intel HD Graphics 4400. With an idle noise level of 29.7 dB(A), the fans of our review sample not only spin slowly, but also almost inaudibly. 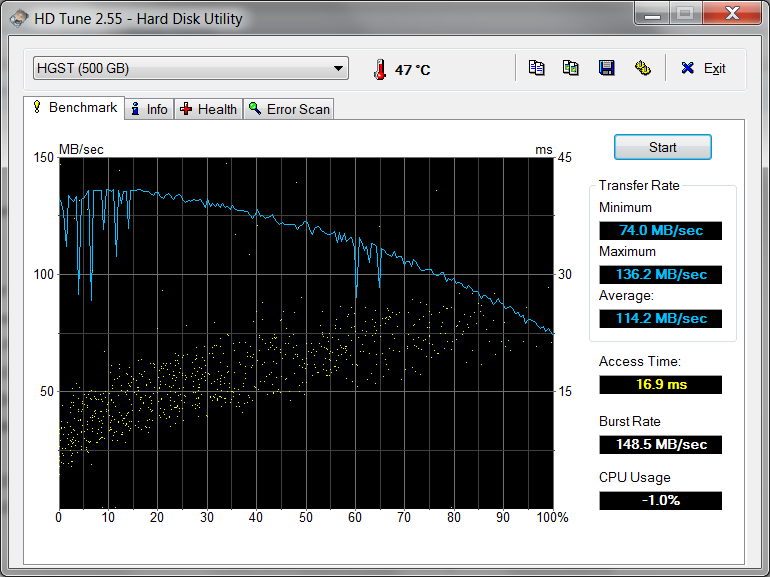 The reason for this is the hard drive that slightly exceeds the fan's noise. The laptop's cooling is anything but deafening even during load. Instead, we hear a sine-wave-like noise, at least sometimes. The noise fluctuates between 37.4 and 33.5 dB(A) in an interval of approximately 2 - 4 minutes. The latter rate is the normal case. This is actually a good outcome, if it were not for a high-pitched buzzing noise that we could not localize. The noise annoys almost consistently, and is only interrupted for a moment and reappears after about an hour of operation. Nevertheless, this is a no-go for concentrated work in quiet surroundings. This also leads to a point deduction: without this buzzing noise, the laptop would have achieved a sub-rating of 94% in noise; the laptop would have achieved a total rating of 86%. The Tecra A50 remained relatively cool with an average temperature of approximately 32 degrees Celsius (89.6 Fahrenheit) in idle mode. It only reached slightly higher 37.9 degrees Celsius (100.22Fahrenheit) in the rear center area, on the base unit's underside. This looked different after our stress test where we completely max out all the performance reserves of the laptop. A hot 59.3 degrees Celsius (138.74 Fahrenheit) were again measured on the underside, but this time in the fan's area. The vents reached a temperature of up to 67.1 degrees Celsius (152.78 Fahrenheit). The upper side largely remained unaffected from these temperatures with a maximum of 45.5 and an average of 35 degrees Celsius (113.9 and 95 Fahrenheit). 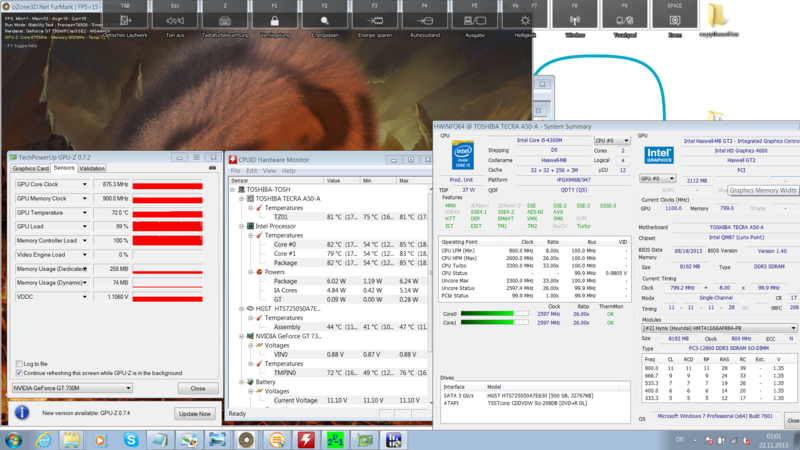 We did not ascertain excessive temperatures on the keyboard during the stress test. 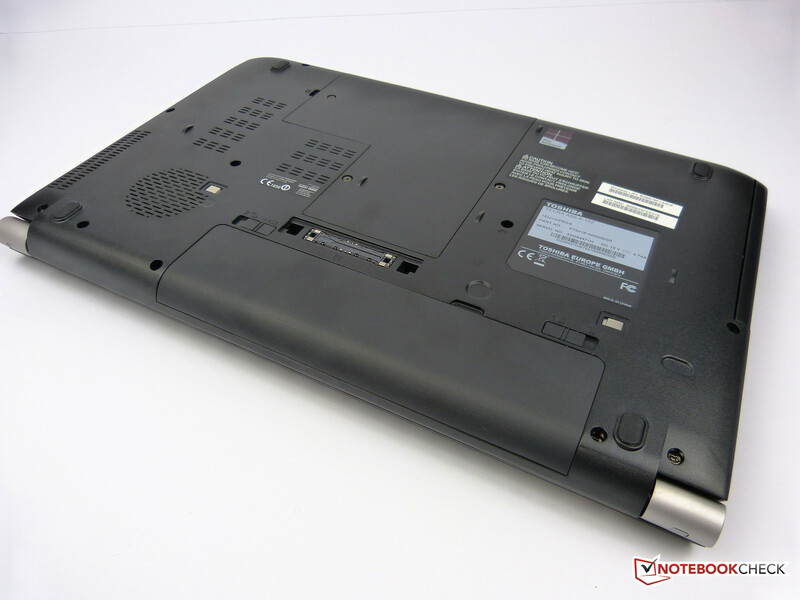 The reason for the high temperatures in the underside's rear back area is found in the laptop's fan design. 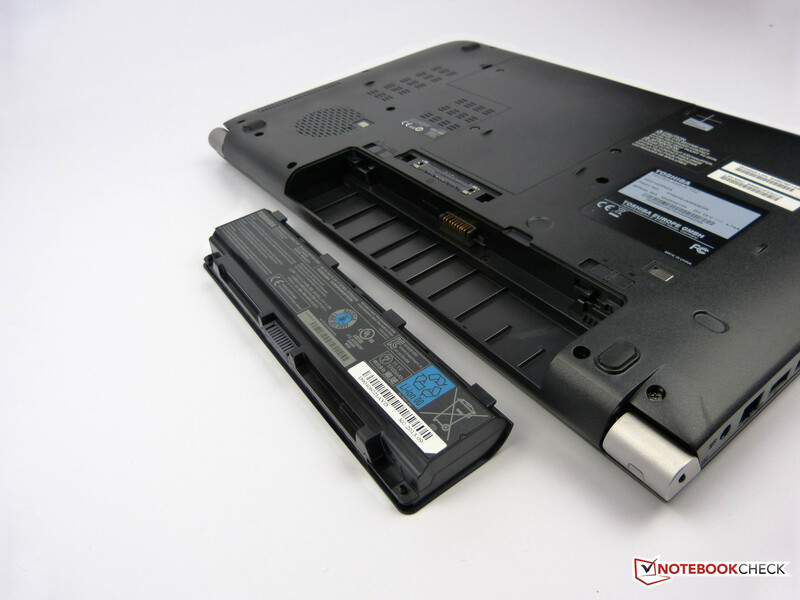 The hot waste air is not only blown out of the side, but also discharged directly on the surface where the laptop is placed. Our review sample could however be used on the lap during normal load operation without problems. Our Throttling Test had a positive outcome. The clock of a single core only rarely dropped from 2.6 GHz to 800 MHz for fractions of a second. 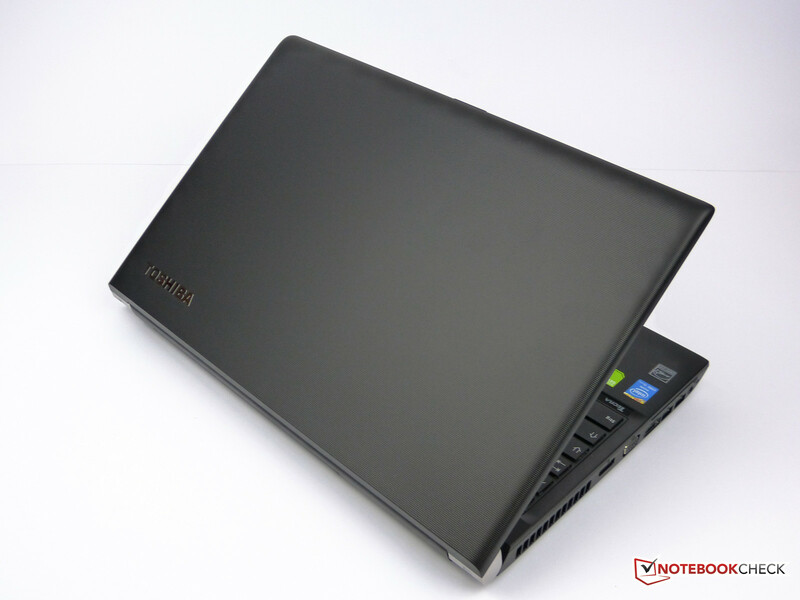 Thus, the laptop manages its waste heat well and does not throttle its performance for temperature reasons. It however almost maxes out its cooling reserves. 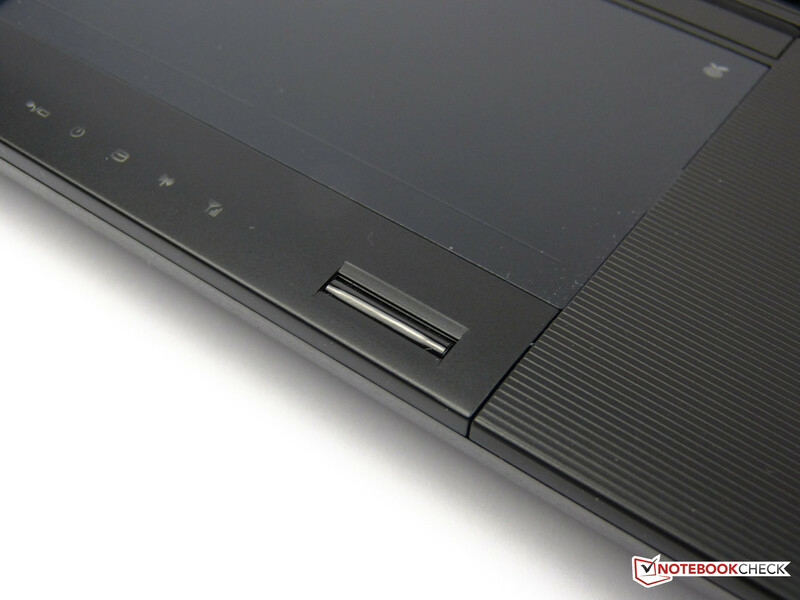 Like in the majority of business laptops, the speakers in our review sample present a rather average sound quality. The sound reproduction is quite muffled, and the maximum volume is limited. However, they do not overload or distort. 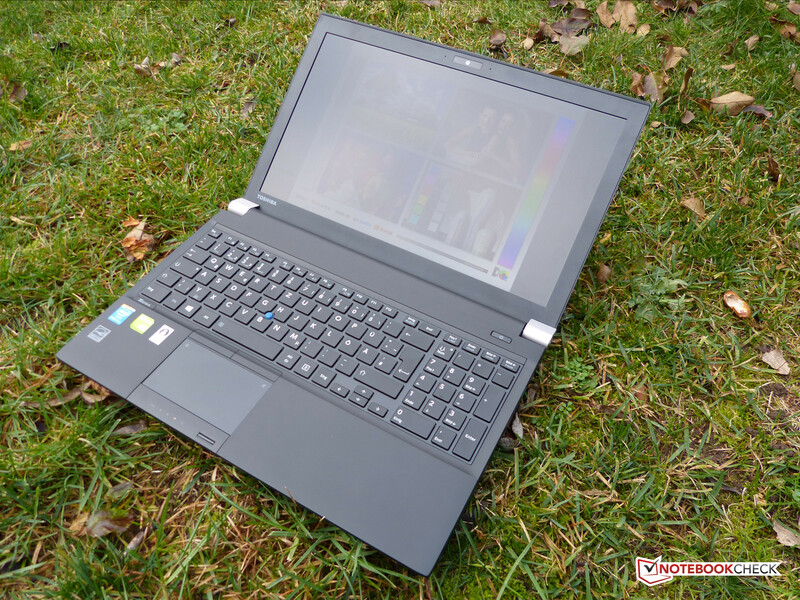 Toshiba's Tecra A50 proves to be quite energy-efficient. Our review sample achieved overall good consumption rates with just 5 Watts in the lowest brightness setting without load and 10.7 Watts with enabled dedicated graphics and Wi-Fi, but no processing tasks. 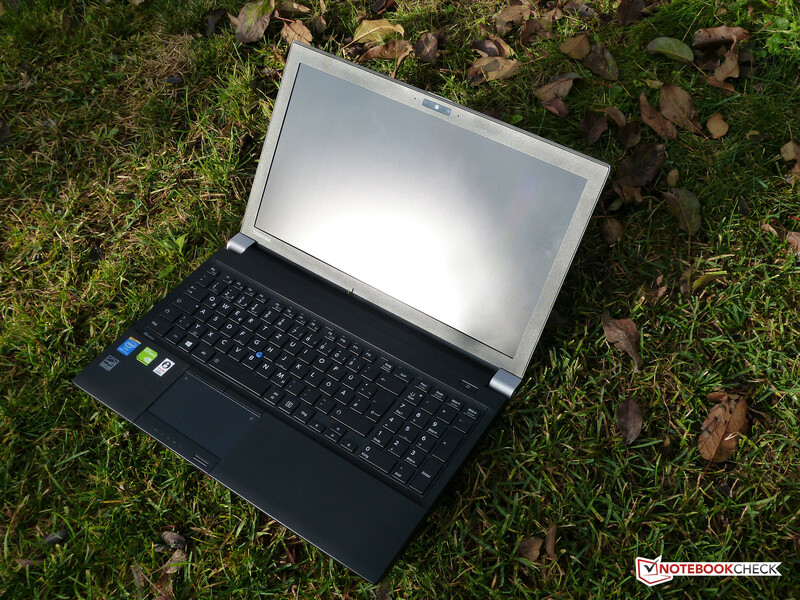 Since we do not have a laptop with the same hardware, we compare Acer's Aspire V3-571G that also features a GT 730M and Intel Core i5, but from the former generation. This laptop consumes 8.6 and 13.0 Watts, which is category average. The dedicated graphics and CPU demand a maximum of 63.7 Watts from the power supply during load. This rate is also in the lower field; the Aspire V3-571G consumes 75.4 Watts. Thus, the power supply designed for a power consumption of 90 Watts is sufficient for our review sample. Our review sample's battery runtimes are overall average. However, they have improved compared with the precursor's. Although the battery's capacity of 66 Watt-hours has not been altered, the Tecra A50 benefits from disabling the dedicated graphics card. 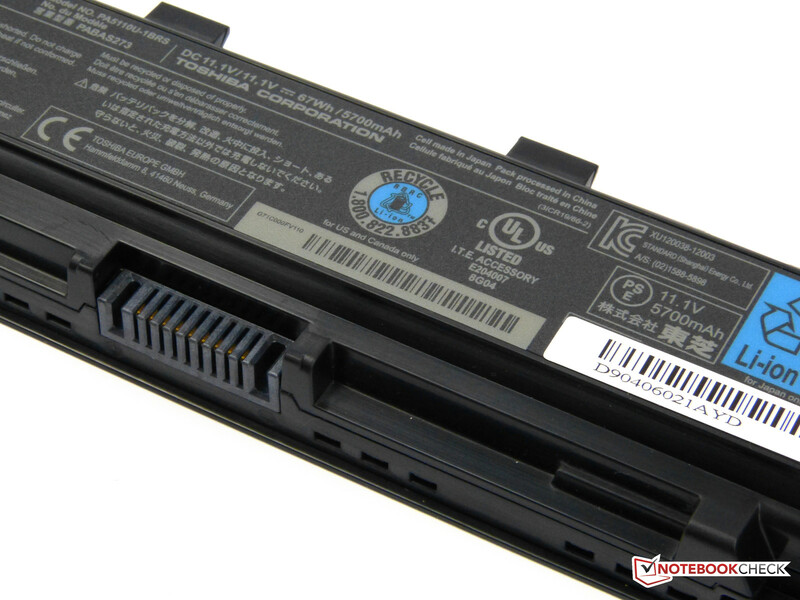 Thus, the laptop could achieve a runtime of 8 hours and 19 minutes in Battery Eaters Reader's test. The predecessor was drained after 5 hours and 25 minutes in this test. 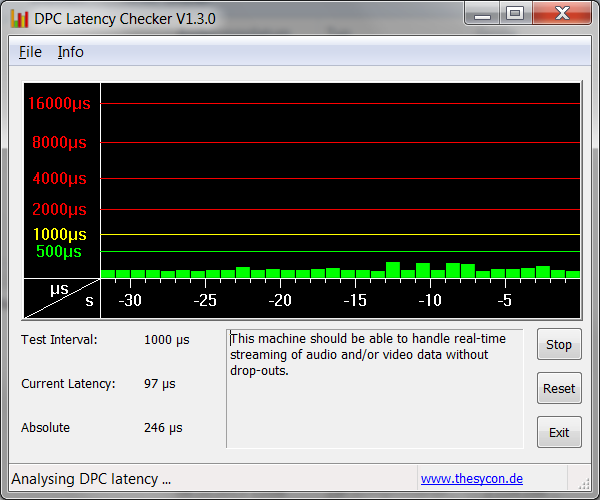 The laptop runs with disabled wireless connections and minimum brightness in this test. Our Wi-Fi test is more significant for real-life use. New Internet content is opened every 40 seconds in the browser here. The battery still lasted for 5 hours and 30 minutes, in contrast to the predecessor that shut down after only one and a half hours. The runtime naturally decreased when we kept our review laptop busy. The GPU and CPU are equally loaded in the Battery Eaters Classic test. In addition to active wireless modules and maximum screen brightness, the "High Performance" energy profile was enabled for this test. The laptop also surpassed its predecessor (1:22 h) with a runtime of two hours and six minutes in this case. On the whole, these runtimes should be enough for business use. 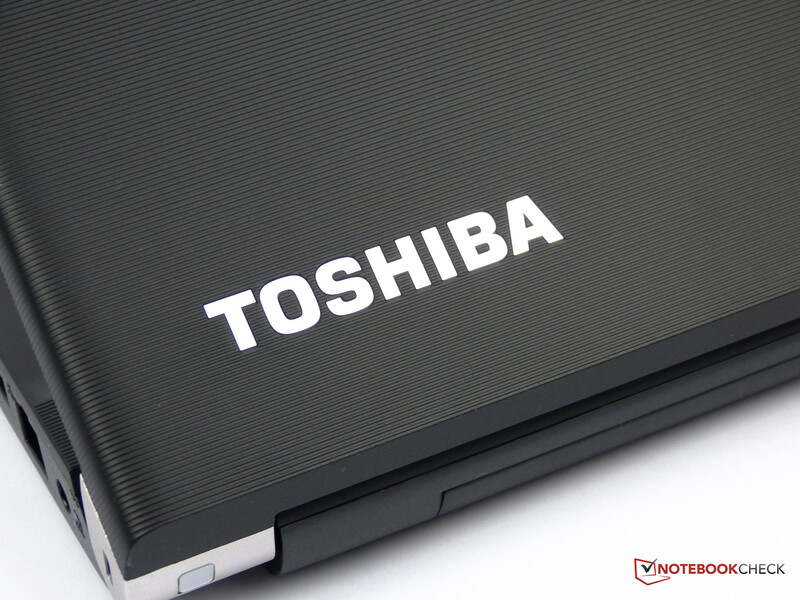 Buyers who want to save weight by using a battery with a lower capacity can purchase one via Toshiba's website. There are models with 60 and 44 Watt-hours for 169 and 144 Euros (~$232 and $198). The battery runtime can also be increased with a secondary battery. Toshiba launches one of the first business laptops on the market that is based on a Haswell processor for a price of approximately 1300 Euros (~$1788). It also includes a healthy number of pre-installed software and hardware options. This is inevitable for the device because the application performance is comparatively below-average. Nevertheless, it should be sufficient for slightly more complex business applications. Compared with the former Tecra R950, it is primarily the dedicated Nvidia graphics card alongside Optimus technology that is a step forward. A Wi-Fi battery runtime of 5 hours and 30 minutes allows relaxed working. Other plus points for the office machine are its input devices and the screen. While we cannot complain about anything but the small space bar in the former, we would have hoped for an IPS screen. This would have boosted the already good, matte screen to perfection. 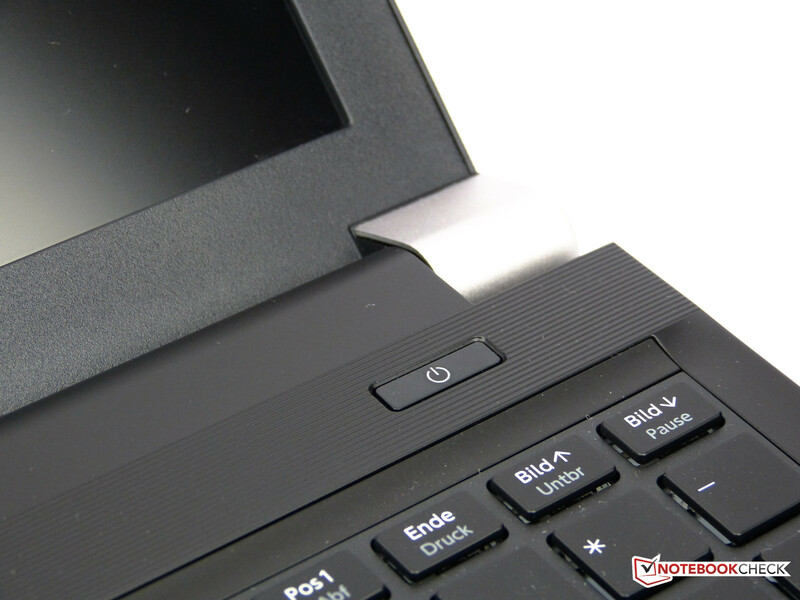 In return, the Tecra A50 innately sports both a SmartCard Reader and ExpressCard slot. Nevertheless, the laptop is not meant for people with good ears. The device produces a high-pitched buzzing noise after a while of use. Users who do not hear high frequencies for whatever reasons will not be affected - everyone else will have to say good-bye to a quiet working atmosphere. Therefore, we would not recommend a hasty purchase, especially since the first Haswell devices from the competition are now being launched on the market. While the ThinkPad T540p is already available, HP has now announced its ProBook 650. Potential buyers should include these laptops in their purchase considerations for the aforementioned reasons - and possibly to avoid premature tinnitus. ...which can be disabled quickly and easily. ...and number pad key is something special. The space bar is unfortunately a bit small - and therefore not in the picture. By the way, the keyboard also features a backlight. The Tecra A50 also looks appealing from the outside. Unusual: A combo port with eSATA and USB 2.0, and the SmartCard reader. 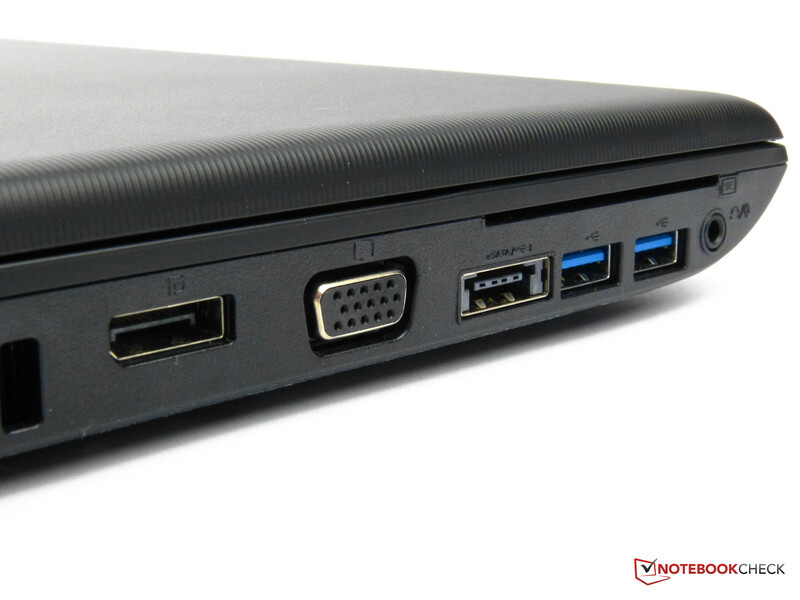 Toshiba omits an HDMI port. ...a Full HD resolution at a size of 15 inches. A fan on the underside discharges waste heat. ...but also a removable battery. ...the buyer will find an empty RAM bank. ...the meticulous build and extensive interfaces. ...a working environment void of distracting background noises. ...the relatively poor application performance.